A stainless steel threaded couplings are used to connect pipelines transporting a wide variety of media. The stainless threaded couplings provide high-quality tightness of pipe connections, while not violating the integrity of the ground. Installation of the threaded couplings is carried out quickly and easily, without requiring special knowledge. 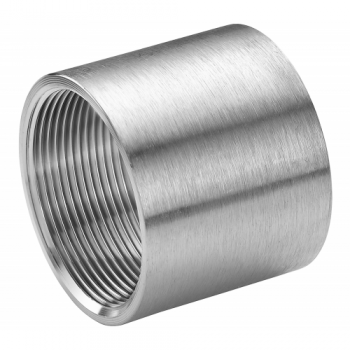 Stainless steel threaded couplings are simple and reliable parts, completely ready to use. We offer couplings of diameters from 15 to 100 mm. 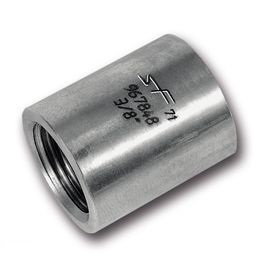 We offer full threaded coupling, half threaded couplings and reduced threaded couplings. Stainless socket, seamless DIN EN 10241 The stainless socket of this type looks like a short piece of stainless pipe, with full length inner female thread. It's used to connect other valves or stainless fittings with male thread. The stainless sockets we offer have BSP thread, but at request we can deliver also NPT stainless sockets. The th..